Dubarry of Ireland is an Irish-owned company who manufacture and retail high-end footwear, clothing, leather goods and accessories. Established in 1937, the first Dubarry of Ireland flagship store was opened in Dublin in 2012. 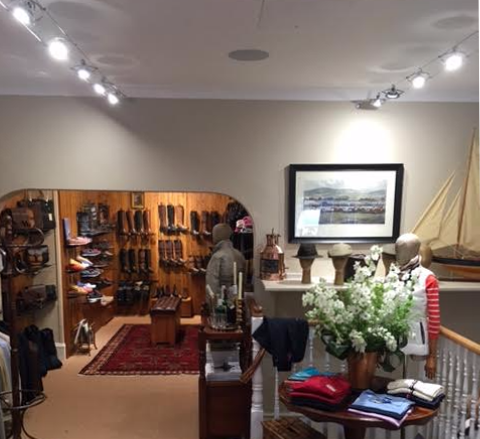 In 2013, the second Dubarry flagship store opened its doors in Chelsea, London. Dubarry also wholesale their country and coast collection through many department and speciality stores and also to individual retailers worldwide. Dubarry approached LED Illuminations (2009) Ltd., in January 2016 for advice on lighting their wholesale unit in Oxfordshire which was being refurbished. After much discussion on the building and required image, LED Illuminations sourced a contemporary low voltage 2 wire LED system which could house a range of AR111 LED lamps with different colour temperatures and beam angles. A mixture of 2700K and 4000K lamps in 30 degree and 140 degree beam angles were supplied. Dubarry were thrilled with the effect this LED lighting system had on their product range and premises that they came back to LED Illuminations in May to discuss supplying a similar system for their first new retail outlet in Cheltenham, Gloucestershire. The Cheltenham store opened its doors on 1st June with the LED 2 wire system lighting the interior. The soft tones of the 2700K and 4000K LED lighting made the existing window track system look out of date. At the time of writing, LED Illuminations are sourcing a replacement system for the store window. By using a lighting system with replaceable lamps rather than a complete luminar it is possible to repeat the same beam angles and colour temperatures whether track, wire or down lights. Now that Dubarry have found a formula to light their stores to bring out the best in their high quality products, LED Illuminations are hoping to provide similar systems to their Dublin and London flagship stores.